Description: D&H C420 #404 (ex-LV) at Oneonta yd. Description: The engines on a Westbound are uncoupled from their train and heading down to get fuel. Description: A D&H Westbound departs Hornell and appears to be racing the station wagon on the parallel street. Description: The D&H high & wide train arrives at BD Tower. Description: Much darker when the arrived the yard! Description: D&H at Bainbridge, NY. 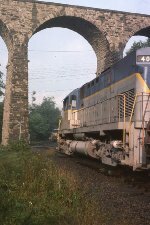 Description: Delaware & Hudson C420 404, C424m 462 & 463 head north on the former Jersey Central main line at North Catasauqua, Pennsylvania, USA, 29 October 1981. Description: D&H at Bevier Street Yard in Binghamton, NY. Description: D&H GP38-2 7314 (ex-LV 314) leads U23B 2316, C420 404 (ex-LV 404), and mixed freight through Port Kennedy on Washington's Birthday in 1982. 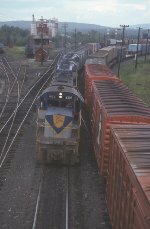 Description: D&H GP38-2 7314 (ex-LV 314), U23B 2316, and C420 404 (ex-LV 404) slowly roll through Abrams yard with mixed freight on Washington's Birthday in 1982. Description: The rear end of MEPO passes the headend of BASE at Montague station. Description: At the fuel rack.